Photo: Johanna de Graffenreid, JJC Program Director, in front of an on-site storage facility. In 2016 North Bennington residents found the toxic chemical PFOA in their drinking water wells. Over the past two years we have spoken with thousands of neighbors across the state only to hear that far too many of them have experienced drinking water contamination issues. Vermont has a total of 1,377 active public water systems, 97% of these are small community systems. 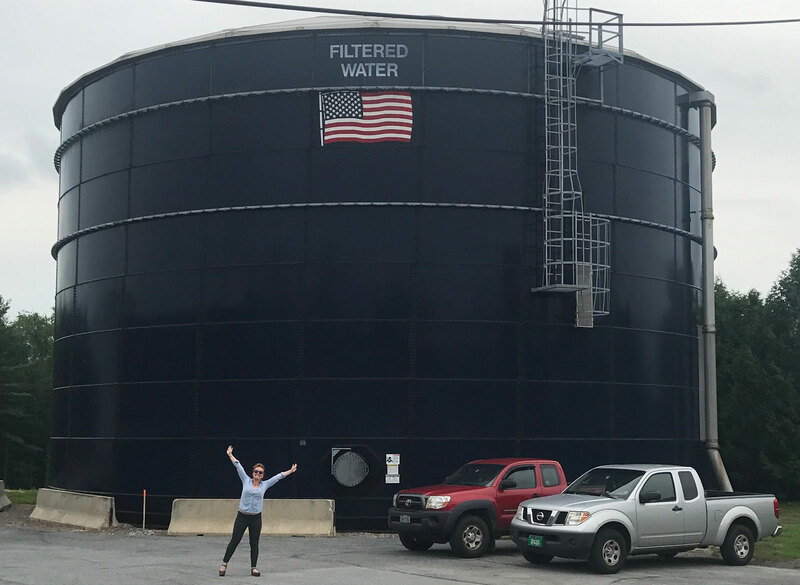 Recently Rights & Democracy program director, Johanna de Graffenreid, toured the largest drinking water treatment facility in the state. Whether it’s job training, increased climate resilience, or improved testing and safeguards from toxic contamination; Vermonters deserve clean drinking water. The South Burlington Water Treatment Facility (SBWT) serves approximately 75,000 Vermonters and 12 municipal systems. The staff tests for cyanobacteria, PFAs, pharmaceuticals and personal care products, and other known contaminants. SBWT is renowned for their advanced testing for future or potential hazards in drinking water before it’s officially required. However, they are open about the fact that very few other systems also test for cyanobacteria and that for most of our systems only 74 chemicals out of over 86,000 used in the U.S. are required for any sort of testing. Rights & Democracy’s Clean Water for All campaign is demanding that industry disclose chemicals they use to the public in a clear way, and that state regulators set strong standards on known toxics in our drinking water. In 1991 the EPA came out with new regulations about lead and copper pipes. Water systems across the country have been using zinc orthophosphate since the 1960’s and in recent decades it’s been used to negate the impacts of lead or copper from pipes leaching into drinking water. In Flint, MI when the drinking water system switched to a new intake they completely wiped out their ability to negate the lead & copper in the pipes of their residents. This is because the additive takes approximately two months to work effectively. To ensure that the public is safe, the SBWT staff have a mini-home system called “Bill & Bob”. The Bill & Bob system replicates a home drinking water system and tests to make sure that water coming out of our taps is safe from lead & copper. RAD asked the staff on site if other systems around the state, especially those that serve small communities in Vermont, were using similar technology. A simple “no” from SBWT staff was the response. Our drinking water infrastructure needs serious work, and our small scale systems must start testing to protect us from lead poisoning. During Hurricane Irene, communities across the state faced power outages and impacts from contaminated flood waters to their drinking water sources. With over 10 percent of Vermont’s population served by the SBWT facility, RAD was curious about the level of climate resiliency in our drinking water systems. While SBWT is better than most systems across the state, with 19 storage tanks and 6 remote pump systems, SBWT staff told RAD that there is currently only 1 day of emergency water in the system. That means if a power loss or contaminant release causes the intake to shut down, 12 municipalities would have only 1 day of drinking water on hand until repairs can be made. If water sits in tanks for days or weeks on end, the water can go stale, leaving our system vulnerable to contamination. It’s up to each local municipality to add local storage tanks in order to meet the particular emergency needs of their community. We need public financing and a tax system where all neighbors pay their fair share to finance and build additional infrastructure so our drinking water systems are prepared for the impacts of extreme weather. Staff at SBWT have a Bachelors of Science in Environmental Science and go on to earn their Public Water System Operator certification. The only state requirements for certification are a high school diploma or GED, followed by an exam and several years of experience in water treatment. Most systems have volunteer operators or pay for a consultant to make sure that the systems are working like they’re supposed to. With knowledge of new and emerging contaminants, like unknown chemicals (including unregulated pesticides) – and the impacts of climate change on our drinking water systems – RAD supports additional funding of technical & community college programs that will better prepare our operators for emergencies and promote local, good-paying jobs. 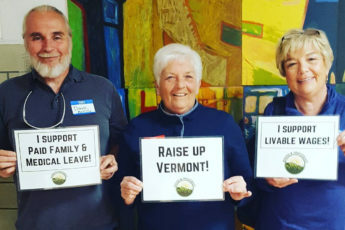 Rights & Democracy will launch the next phase of our Clean Water for All campaign in October of 2018 with the goal of taking willing volunteers, training them in organizing skills, and hosting community-led education events for their neighbors to build broad public support for improving drinking water infrastructure and quality in Vermont. Become a member by donating here, or sign up to become a RAD community leader here. Email Johanna at johanna@radvt.org for more information. PS: You can learn more about drinking water systems across the state on the Department of Environmental Conservation’s website.